Today an unfortunate fire incident occurred at Enden manna village of Namsai dist, of Arunachal Praesh.As explained the cause of the fire is due to short circuit. 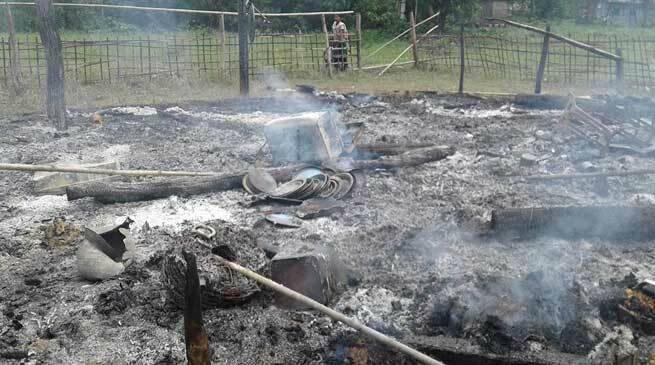 The fire burn down all the belongings of the family including traditional utensils, crafts, important papers etc. The owner, Nang Bina Mounglang, Wife of Lt C T Mounglang a poor widow lost all her family belongings except clothes that were on the families body. Members of ANAYA paid a visit to the spot and donated some utensil items and other items as. ANAYA request every body to be helpful in such types of needful hours to come forward whenever n wherever occurs.